The first impression Greg Millar leaves when he meets Lucy Arigho isn't good. However, soon he makes up for his rude behavior and she gives him another chance. Greg is a talented author and Lucy is fascinated by him professionally as well as personally. Lucy is a designer and is working on the cover of his new book. Greg manages to charm Lucy and even though she thought she wouldn't be ready to love someone again he convinces her to give him a chance. He even proposes to her when they've just started dating. Greg is a father and has two children. Lucy's first real test is spending a family holiday with them. However, Greg's nanny is there as well and she's far from happy with Lucy's presence. She doesn't want Greg's family to like Lucy. Meanwhile Greg's behavior starts to become stranger and stranger. Lucy barely recognizes the man she's on holiday with, Greg isn't the same person she fell in love with anymore. What's happening to Greg and is Lucy's love for him strong enough to stay and find out? Will Greg's actions eventually break her heart? The Accidental Life of Greg Millar is a beautiful moving story. Lucy's careful when it comes to love. She's been through a lot already and the last thing she needs is more complications in her life. The first weeks with Greg are fun, but then his behavior starts to change. My heart ached for Lucy, she doesn't know Greg's family all that well and she's being placed in a situation she's not comfortable with, but can't get out of either. She's stronger than she thinks and I loved her caring nature and perseverance. I had my suspicions about what was going on with Greg and Aimee Alexander describes what's happening to him in an impressive poignant and honest way. I was blown away by her story and loved it from beginning to end. The Accidental Life of Greg Millar has many emotional layers. It's a story that brought tears to my eyes. Aimee Alexander has written a surprising and brilliant story about an important subject and I greatly admire the way she's done this. Lucy and Greg seem to be the perfect couple until things start to unravel completely. This happens in an irrational, but somehow also natural way and that makes the story really good. Aimee Alexander knows how to work with tension and perfectly sets the exact atmosphere she needs. The result is a terrific story. I highly recommend The Accidental Life of Greg Millar, it's a fantastic book. 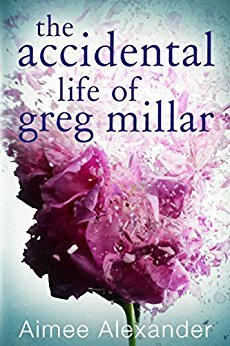 If you love moving stories about complex love with a lot of depth you should definitely read The Accidental Life of Greg Millar. I hope this ends happily, one way or another! I love the relationship dynamics of this book. I can't wait to read it. I just finished this book ! Thanks for being able to more eloquently describe what’s so great about it! I reviewed on Amazon/Goodreads but I’m glad to see a more detailed review. Can’t wait to read more by this author. Love the idea of a romance between an author & book designer. A strange tale, to be sure, but judging from your review, a thoroughly worthwhile read.